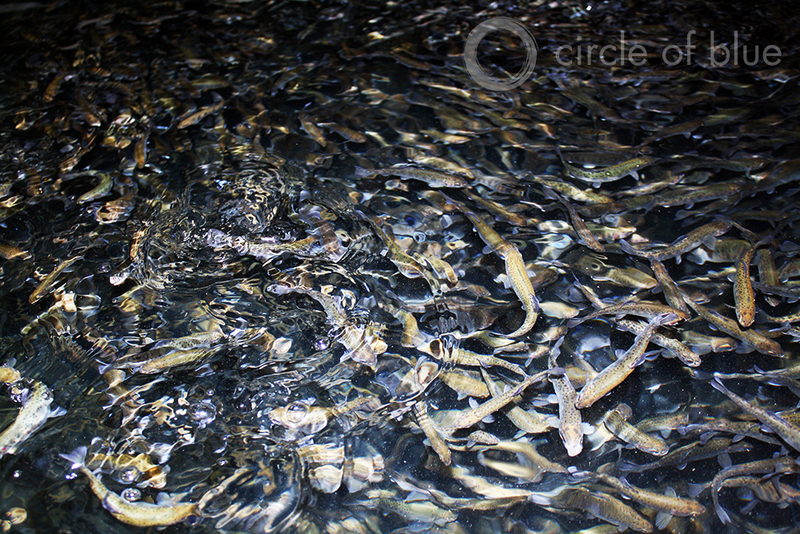 Fingerlings pounce on food at the Harrietta Hills Trout Farm in Harrietta, Michigan. Dan Vogler, the owner of Harrietta Hills, sees a bright future for aquaculture in Michigan, but some scientists and environmental groups are concerned about risks to water. Click image to enlarge. HARRIETTA, Michigan – When Dan Vogler, Michigan’s largest commercial fish farmer, purchased the Grayling Fish Hatchery two years ago, the 45-year-old producer was widely viewed along the banks of Northern Michigan’s Au Sable River as a civic hero. Built in 1914 to replenish the region’s grayling and rainbow trout fishery, the hatchery closed in the 1960s, reopened in 1983, and then changed ownership and management three times within three decades. Vogler’s plan was to end decades of institutional uncertainty by expanding production of farmed trout for state markets while also ensuring that the stream of summer tourists to the historic hatchery could continue to feed and catch trout (50 cents an inch) in pools filled with the Au Sable’s famously clean and cold water. Two years later, Vogler’s plan for the Grayling hatchery, and his dream of developing Michigan’s tiny $US 5 million aquaculture industry into a $US 1 billion protein-production sector, confront 21st-century legal and cultural obstacles. On July 1, 2014, after months of review, the Michigan Department of Environmental Quality approved Vogler’s permit application to expand trout production from roughly 9 metric tons annually to 136 metric tons (20,000 pounds to 300,000 pounds). The permit specified the management practices needed to limit pollution to the Au Sable from increased levels of phosphorous and other nutrients contained in the much higher amounts of fish food and fish wastes. Six weeks later, on August 11, 2014, the Michigan Chapter of the Sierra Club and the Anglers of the Au Sable, two of the state’s most influential guardians of state waters, filed a formal petition asking a judge of administrative law to overturn the permit. The groups cited pollution, pathogens, and escaping fish as reasons to reject the Grayling project. The DEQ has set clear limits for the hatchery. The permit requires that no more than 35 micrograms of phosphorous per liter (about 5 ounces in 1 million gallons) of wastewater be discharged to the river during the growing season, from April to September. To stay within those constraints, 90 percent of the fish waste will be captured before the water re-enters the river; Vogler plans on using a settling basin to accomplish this. Despite the strict permit, the Sierra Club and Anglers of the Au Sable say that they are still uncomfortable with expanding a fish farm in one of the most pristine rivers of Michigan. 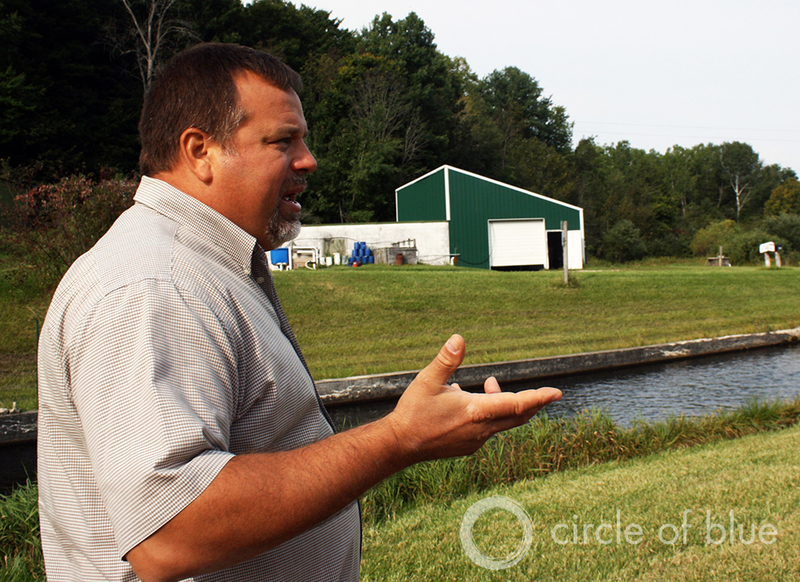 “If you convened a panel of experts and asked them the dumbest place to put a commercial fish hatchery, they would say this section of the Au Sable River,” said Marvin Roberson, a forest ecologist with the Sierra Club, in an interview with Circle of Blue. The Sierra Club is mainly concerned with waste pollution, escaping fish, and whirling disease – a parasite that infects salmon and trout and interferes with normal growth, causing the fish to swim erratically or “whirl.” In addition to changing the ecological makeup of the river, they fear waste discharges from the facility could make the Au Sable more favorable for whirling disease. If there is an outbreak of the disease in the hatchery, there is concern that it could be transmitted to wild populations in nearby lakes and rivers. The nutrient discharge limits do not reassure Roberson. Vogler and his colleagues in Michigan’s tiny aquaculture industry are frustrated by the opposition, because the state is so well set up to raise fish. Michigan contains 10 percent of the world’s surface fresh water, but farms less than 1/100th of a percent of its fish – a meager $US 5 million in annual production. Although Michigan’s six state fish hatcheries have been producing native trout and imported salmonid species for stocking public waters since the early 20th century, food fish farming has yet to take hold. Dan Vogler, the owner of Harrietta Hills, really believes in what he is doing. “Agriculture is doing the world a service. We have to feed people – otherwise we have war, pestilence, and starvation,” Vogler told Circle of Blue. Click image to enlarge. Vogler is the leader of a group of ambitious fish farmers looking to change that. In January, the Michigan Aquaculture Association (MAA), headed by Vogler, released a proposal for a 200-fold expansion of farm-raised fish production in Michigan by 2025. The proposal, “Strategic Plan for a Thriving and Sustainable Michigan Aquaculture,” was produced as part of a Michigan Sea Grant project that focused principally on economic and regulatory matters and offered lofty long-term goals, including yearly production of $US1 billion in Great Lakes seafood. This is the equivalent of approximately 225,000 metric tons (500 million pounds) of farm-raised fish in Michigan each year. All of these big ideas are being hatched on Vogler’s 120-acre trout operation in Harrietta, Michigan, a town of 143 in Wexford County. His farm is family-owned and unpretentious. The outfit includes a couple of indoor hatcheries (one in the barn basement that dates from the 1940s), a series of earthen ponds and concrete raceways, and the Vogler home, where Dan lives with his wife, father, and six children — ages four to 21. The place is far more rural than industrial, and the decades-old infrastructure is impeccably cared for. The wooden bat condominiums affixed to the barn walls give the sense that this is somebody who is generally ecologically aware. Vogler views aquaculture in the Great Lakes as a more eco-friendly option than mass import of farmed fish from Asia or continued wild harvests in the face of collapsing ocean fisheries. According to a recent report by the United Nations Food and Agriculture Organization, global demand for fish has never been so high, and sales are growing by $US 10 billion annually. Fish accounts for nearly 17 percent of the world’s animal protein intake. Fish are cheap and nutritious, and the UN touts aquaculture as an essential tool in the fight against world hunger. Farmed fish have the potential to achieve a super-efficient feed-to-meat conversion rate – 1.5:1 or even 1:1. This means that, under the right conditions, a kilogram of feed could translate into a kilogram of fish. With the lion’s share of farmed fish coming from China (62 percent), North American aquaculture currently accounts for less than 1 percent of global production. The top four aquaculture states – Washington, Mississippi, Alabama, and Louisiana – had 2013 annual sales estimates of $US 233 million, $US 204 million, $US 111 million and $US 91 million respectively, according to the USDA National Agricultural Statistics Service. Still, the United States imports 91 percent of the fish that it consumes. Despite the apparent need for more domestic aquaculture in the United States, getting Michigan on board may be a tough sell. The MAA proposes not only inland facilities but cage culture farms in the open waters of the Great Lakes. In contrast to the on-site waste capture that is available for flow-through systems like the one in the Au Sable, there is no economical way to catch extra feed and excrement coming from cage culture operations. For some, this possibility is very hard to stomach. This basement fish hatchery at Harrietta Hills dates to the 1940s. Click image to enlarge. The MAA plan also suggests that specific areas of the Great Lakes, though none have been designated, could be appropriated for fish production. This part of the proposal is likely to be a point of contention for more than just Tanner, because it seemingly violates the “public trust doctrine,” which asserts that the waters of the Great Lakes cannot be controlled for private interests. The Canadian side of northern Lake Huron is the only place where the Great Lakes currently support commercial fish farms. At this point, nine small cage production facilities exist in Georgian Bay and the North Channel. The oldest farm has been in operation for 32 years. Karen Tracey, the executive director of the Northern Ontario Aquaculture Association, reports that the Canadian experience has been largely positive. Chris Weeks, regional aquaculture extension specialist with Michigan State University, was the principal investigator on the Sea Grant project that hatched the plan. He told Circle of Blue that there is more research to be done before any cage culture occurs along the Michigan Great Lakes shoreline. Vogler agreed. He wants one thing made perfectly clear. This article glosses over the point that this hatchery has the Au Sable River running through it. The permit does not address the pathogens that could be picked up and destroy the self-sustaining native fishery. 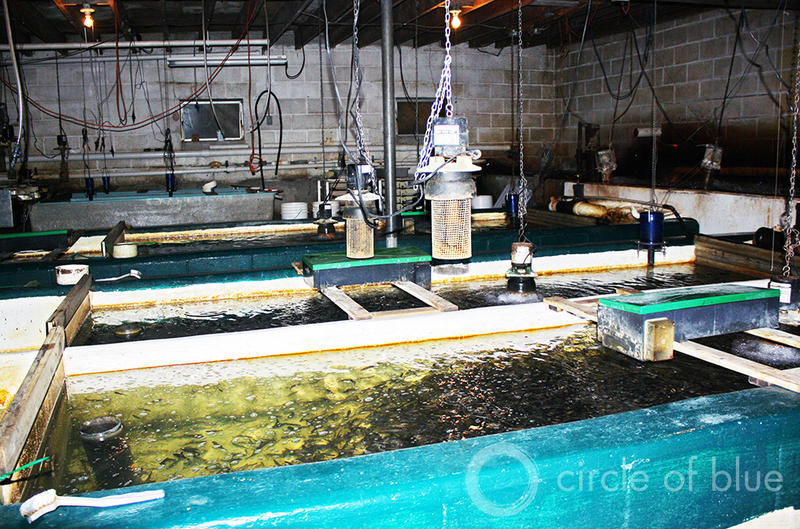 Any aquaculture proposal must not “pollute, impair and destroy” Michigan’s environment. This proposal does not demonstrate that it can meet that requirement.